Marie Laurencin, French painter, printmaker, and stage designer known for her delicate portraits of elegant, vaguely melancholic women. She became an important figure in the Parisian avant-garde as a member of the Cubists associated with the Section d’Or. 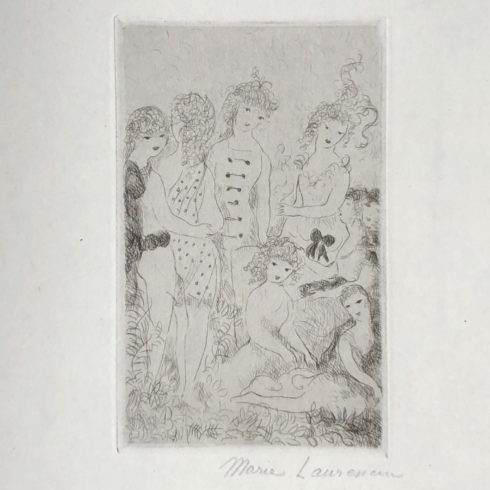 Our Fine Art Gallery has the finest quality Marie Laurencin original prints, etchings and aquatints. We have a large inventory available off-site and we encourage you to make an appointment to see specific works you are looking to collect. We are happy to meet you at either our art gallery showroom or at your home or office for a private presentation. French painter and fine art printmaker Marie Laurencin was born in Paris on October 31st 1883. Marie Laurencin is most noted for her association with the Parisian avant-garde and the Cubist art movement. Marie Laurencin first studied porcelain painting at the age of 18 in Sèvres, France. From 1903 – 1904 Laurencin continued to study art at the Humbert Academy in Paris, where she shifted her focus to oil painting. Among her fellow art students at the Academy, was cubist painter Georges Braque, who she would become good friends with. After being introduced to Pablo Picasso through the art dealer Clovis Sagot in 1907, Marie Laurencin became involved in the avant-garde scene, and a member of Picasso’s inner circle of artists. Amongst her contemporaries were the cubists associated with Section d’Or including: Fernand Leger, Robert Delaunay, Francis Picabia, Henri le Fauconnier, and Jean Metzinger. 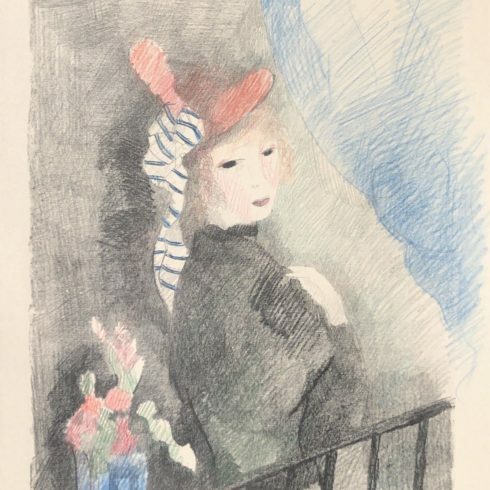 Marie Laurencin exhibited her art with the cubists at the Salon des Independants 1910-1911, as well as the Salon d’Automne from 1911-1912. 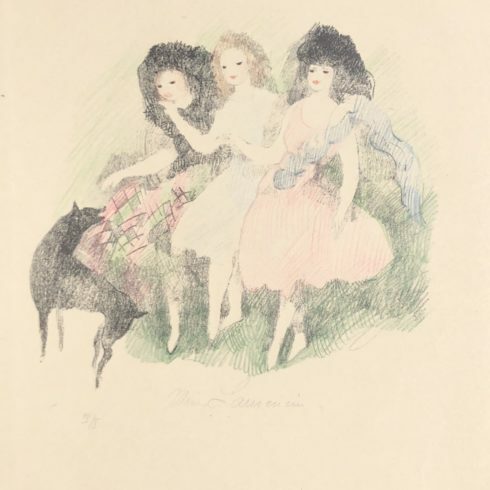 Writer Gertrude Stein, an important patron of avant-garde artists, was one of the first buyers of Laurencin’s work. 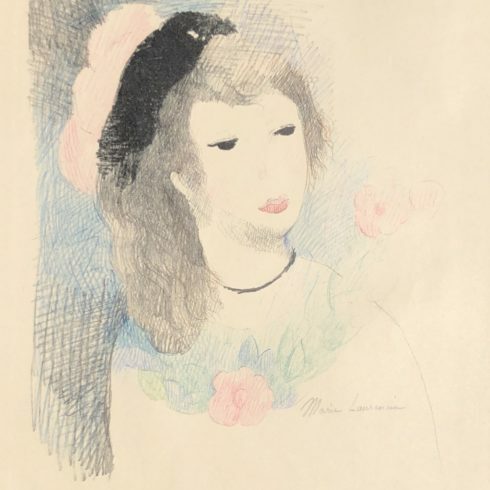 Even though Marie Laurencin exhibited with the Cubists, Laurencin’s art did not represent the movement’s cadence. Marie Laurencin’s artworks are typically recognized for their depiction of pale, dark-eyed women and girls painted in pastel colors. 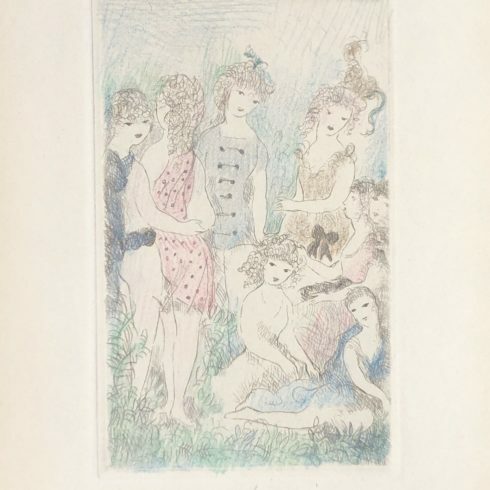 Laurencin developed a unique approach to abstraction in her pursuit of a specifically feminine aesthetic through her use of pastel colors and curvilinear forms. Known as one of the few female cubist painters, Marie Laurencin’s creation of a visual vocabulary of femininity has been seen by some as a response to the masculinity of Cubism. Marie Laurencin’s artworks include paintings, watercolors, drawings, and prints (lithographs, etchings, and aquatints). Marie Laurencin left France during the First World War, living in exile with her German-born husband Baron Otto von Waëtjen. The couple subsequently lived together briefly in Düsseldorf before divorcing in 1920. After the divorce Marie Laurencin returned to Paris where she achieved financial success as an artist. Laurencin illustrated several books, including a 1930 edition of Lewis Carroll’s Alice in Wonderland. Her stage designs included scenery for the Ballets Russes (1924) and the Comédie Française (1928). During the 1930s Marie Laurencin worked as an art instructor at a private school. She lived in Paris until her death on June 8th 1956. In 1983, on the one hundredth anniversary of Laurencin’s birth, the Musée Marie Laurencin opened in Nagano Prefecture, Japan. The museum is home to more than 500 of her works and an archive.